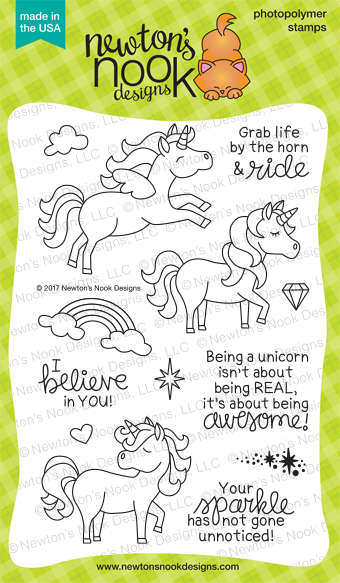 I just LOVE this cute little unicorn shaker card! So cute and colorful! I love shaker cards! What a fun new set! Love that you used the smaller stamps for the background! Such an awesome shaker card! 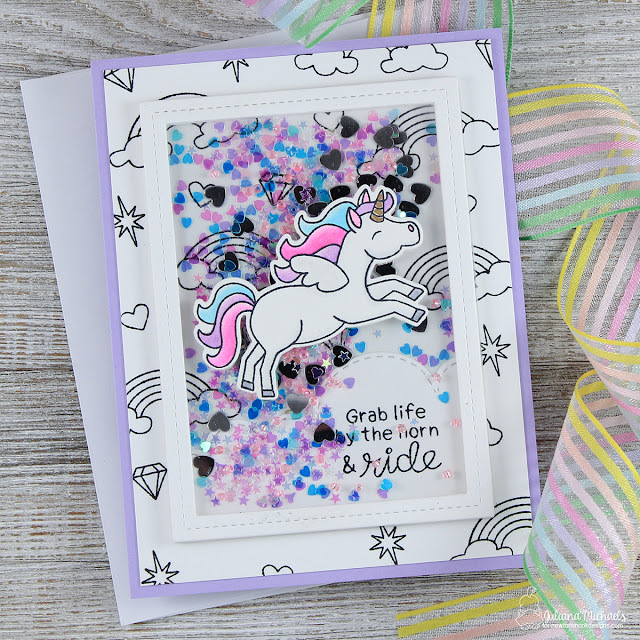 I really like that the card is black and white and that you introduced the color via the unicorn mane and sequins. Great minds think alike! Lol!!! Sequins are really perfect with the unicorns! Love your color choice against black and white background! Really beautiful card! Love your shaker card! And the sequins you used are perfect for this card! 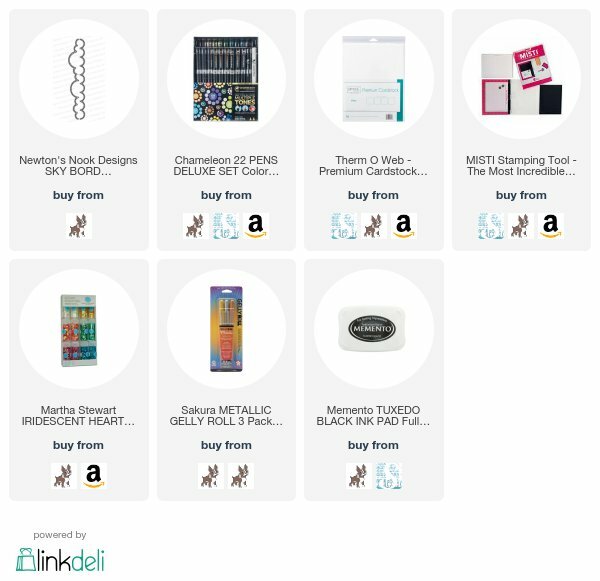 This is fun and magical! Awww!!! Totally sweet and cute!!! Love your adorable card!!! Sequins and Unicorns totally go together. And I love the sentiments in this set! I agree sequins and unicorns are a perfect mix. Love the card. Beautiful colors on this amazing shaker card! 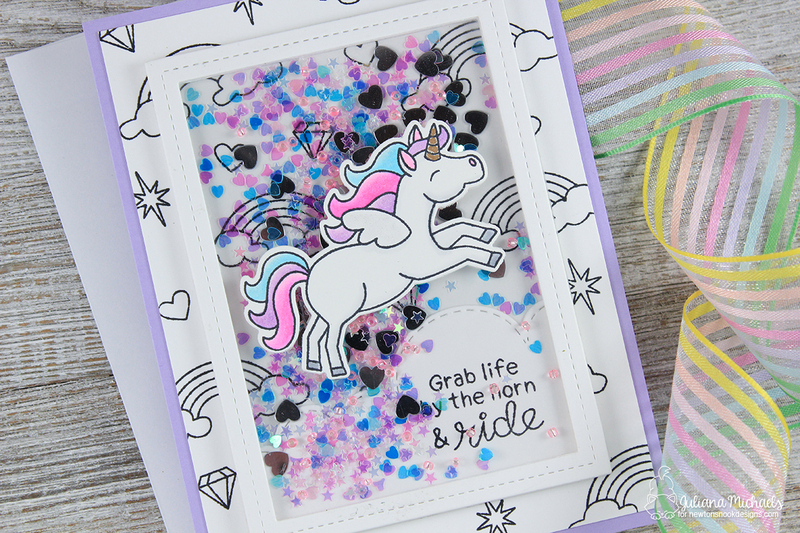 Your unicorn shaker card is truly magical! It looks so pretty with the orchid cardstock and colors you used!!! Nice job!!!! Adorable card! How did you make the shaker window? Thanks. Love this fun, whimsical, and sparkly shaker card! Love your shaker card--and the background stamping you did! Great card! Fabulous card! Love those sequins and your stamped background! Gorgeous card!! I love it with the black and white background!!! Such a pretty card! The colors speak to me and I love the purple with the black and white background on top.